Rapid self-repairing roll-up doors are the technological evolution of old PVC stripes or folding doors, which turned out to be inappropriate for the needs requests. 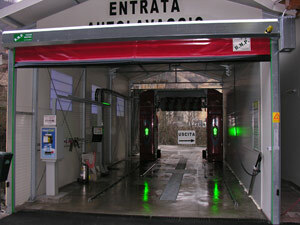 Rapid self-repairing roll-up door typology DYNAMICROLL® WASH is the base of dynamicroll® specially converted to meet the companies operating in the field of car-washes. Through the rapid door appropriate for car wash areas and derivatives is obtained a beautiful industrial product that provides functionality and safety, thanks to ANTI CRASH SYSTEM. Roll-up door dynamicroll® wash can be provided on request in stainless steel material, easy to clean and resistant to oxidation, or in galvanized steel. Dynamicroll® wash door is equipped with powerful engines capable of opening and closing the door very quickly and especially with great safety, thanks to a security monitoring system with a photocell out of the cloth. B.M.P.group provides a Great product in Great security. Contact us for more information. Industrial doors made by B.M.P.group are unique and not repeatable, always be wary for copies. – Rapid self-repairing door type dynamicroll® WASH, suitable for max size 6000 x 5000 h curtain closing in PVC without rigid elements, for outdoor use.